If there were a contest who could sleep the easiest and in the most unusual places, I think the Thais would win hands down. In the west, sleeping in public is frowned upon and sleeping on the job can get you fired. 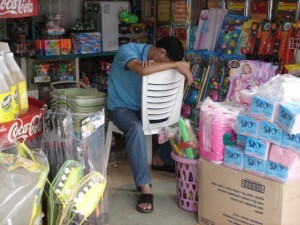 In Thailand there is no stigma associated with sleeping in public, and sleeping on the job is not always an offense. Many times I have seen massage therapists take a nap in between clients in the typical Thai massage shops where many floor mats are lined up next to each other in one big room. If a market vendor has no customers, she might also just snooze for a while, and tuk tuk (three wheel mini taxis) drivers are often seen sleeping in the backseat of their vehicles. Nobody in Thailand thinks that this is unusual or unprofessional. 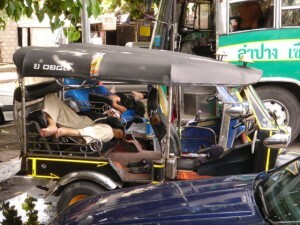 Thais have the amazing ability to fall asleep almost anywhere and in the most unusual places. I have seen many people sleep on their (parked) motorcycles, and I have seen a number of co-riders asleep while the bike was in full motion in traffic. 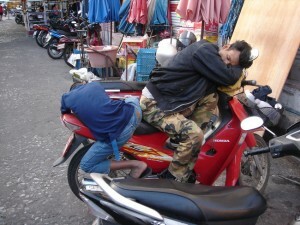 Today I went to my local market and saw a father and his son fast asleep on the same moped. Clearly Thais are less stressed out then their western counterparts, and in general they don’t require mountains of sleeping pills just to be able to sleep through the night. Traditionally Thais have slept on the floor on simple bamboo mats, and in millions of Thai houses this is still the case today. Of course the Thai middle class has adopted western standards and they sleep on normal beds. However it is still an issue in many Thai guest houses and apartment buildings that the mattresses are so hard and uncomfortable that many westerners have a hard time sleeping well. This is because the owners of those establishments buy the cheapest mattresses they can find since they themselves have no problem with sleeping on hard surfaces. When I check out a room in a Thai guest house, my first move is to test the mattress for hardness. The last two apartment buildings I have lived in both had such hard mattresses that I had to buy my own in order to be comfortable. There is not much point in complaining since the Thai owners just cannot relate to our desire for softer sleeping accommodation. It is just not an issue for them. Sleeping within the family environment also differs from western habits. I know Thais in their twenties and thirties who sleep with their parents in the same bed when they visit them. In the west this would be considered highly unusual behavior since children are given their own rooms when they are still very young. 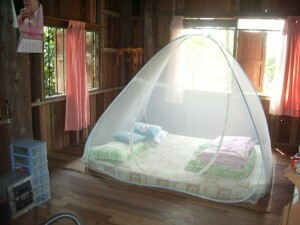 In Thailand it is not common that everyone has their own room. Rather everyone just sleeps together in one room and people just pile into a bed if there is one. Even guests and family friends can sleep in the bed or somewhere in the room. The bed is not claimed exclusively by certain family members. The urban middle and upper class especially in Bangkok is getting more and more westernized in their living habits. However in the smaller towns all over Thailand sleeping is more of a communal affair rather than a private and exclusive one like in western countries. I have had western friends visit me in my home and their Thai girlfriends fell asleep on my couch within minutes. 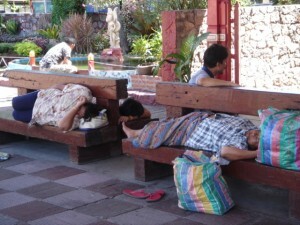 Sleeping in public or in friend’s places or in friend’s beds is normal and acceptable behavior in Thailand. The concept of strict privacy in the bedroom and exclusive rights to a bed is largely absent, especially in the lower social levels of Thai society. ha! that last one is the best… you should submit that for funniest Thailand picture ever. Here are my couple pics on the subject -the funniest I have is people sleeping in the middle of the road in Ko Samui as I crested a hill. 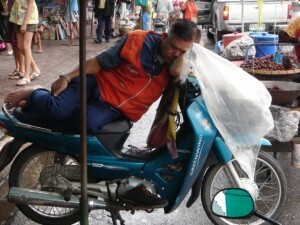 I tried to be quiet with the motorbike, but this guy woke up already – Thai People Sleep Anywhere. I’ll add a link to this page of your article too. That’s funny! I found your blog via Quora. Maybe this is an Eastern thing. I’ve seen similar articles on Japanese and Chinese folk asleep in public, in libraries, at work, on the train etc. Us Brits are far too uptight to fall asleep that easily! I really enjoyed you insight on this phenomenon I see so often around the country. I included it in a Weekly Reblog segment on my own site, along with an excerpt and picture, with copyright credit and link back to you. If you’d like me to take it down, you need only say so. My friend is afraid that I will takeep a photo of him asleep. Is there a Thai superstition about this? This is a strange fear. There are all kinds of superstitions in Thailand. My Thai wife confirmed that there is such a superstition about the picture while sleeping, but this is more of a personal issue. Not everyone believes in this in Thailand. There are different degrees of superstition, ranging from none to the absurd.